What do you get when you combine two of the world’s best-known stacking games? The answer is JENGA TETRIS®. It’s sure to be a party as players push, pull and stack the iconic TETRIS shapes into a JENGA tower like you’ve never seen before! Keep the game going for as long as you can by competing to build the tower to the greatest height possible! Two famous brands join up for a modern twist on the stacking game you know and love. 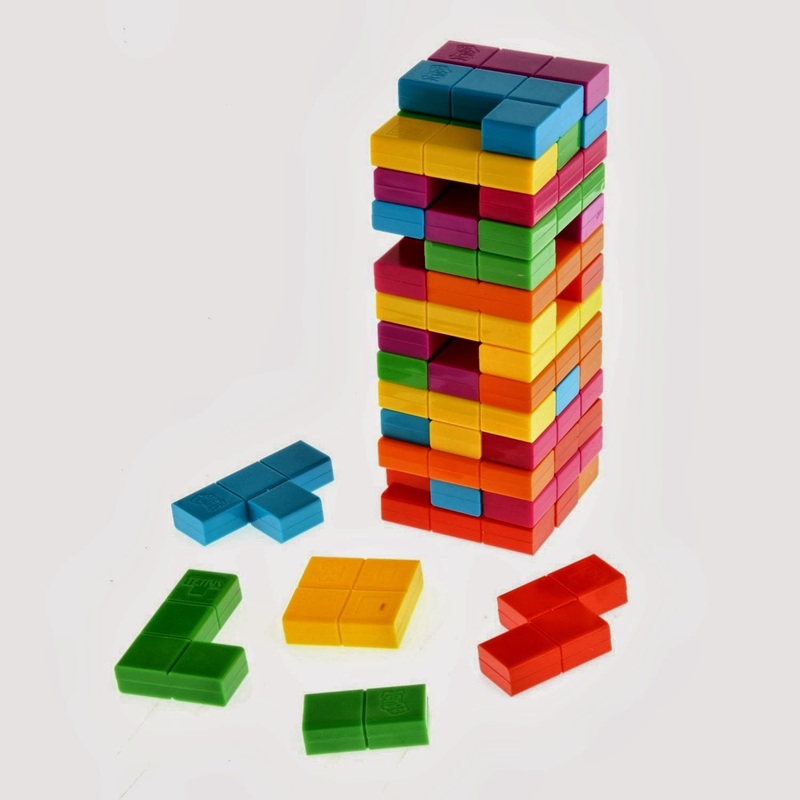 Build the Jenga tower using colorful Tetris blocks that add flare and fun to this familiar game. Get ready for laughs and surprises as you take turns pulling out a Tetris-shaped block and balancing it on top without making the stack crash! This game is easy to learn and can be played with a group or by yourself. But watch out! The Jenga Tetris game is so much fun it can be habit forming! Let your imagination run wild! Challenge friends to invent new ways to play this colorful and exciting stacking game. You can also play solo as you try to beat your own record of building the tallest tower. The Jenga Tetris game can be played by our rules, or you can make up your own. Stack it high, build it wide, remove the loosest block or risk pulling out a block with a tighter fit. Gaps are okay in this Jenga game, but fill in a level completely and you’ll get to pick the next player. Whatever way you play, this is the ultimate block-stacking, tower-crashing game! How does your skill stack up? 47 Jenga Tetris blocks and instructions. One of my favorite episodes of The Big Bang Theory is where Sheldon and Leonard are playing with a gigantic JENGA game, it was made with 2X4’s and they wore hard hats, it was hilarious! This new Jenga Tetris is a great way to play this classic game in a different way (without having to wear hard hats lol) and have lots of fun. Growing up as a child of the 80’s of course I was a big fan of Tetris, this addicting game was fun and it seemed like I could play this for hours and hours! Stacking a twisting all of the shapes, trying not to over stack! And the classic Jenga was always a great party game that was a blast to play. Concentrate and take your time, slowly removing your plank… then time to celebrate (but don’t jump around too much you don’t want to topple it!) you did it. My daughter who is eight years old also loved the game, this was her very first introduction to Tetris or Jenga, she thought this was so cool. 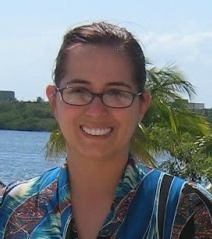 The bright colors, and the challenge was a big draw for her. She usually is not a fan of games that take a while to set up, then fall down because they usually fall very quickly and you barely get to play. 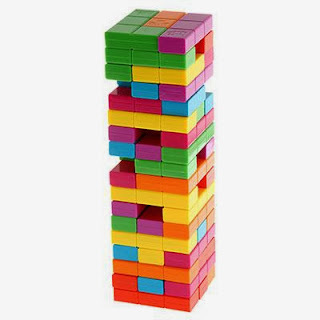 But with Jenga Tetris, there is just so much more playing time, sure you have to spend time setting it up, but you get to play pretty long, and the better the players the longer you play. We all had a great time with this new game twist, the odd shaped planks made it more challenging at times, but it was always fun. 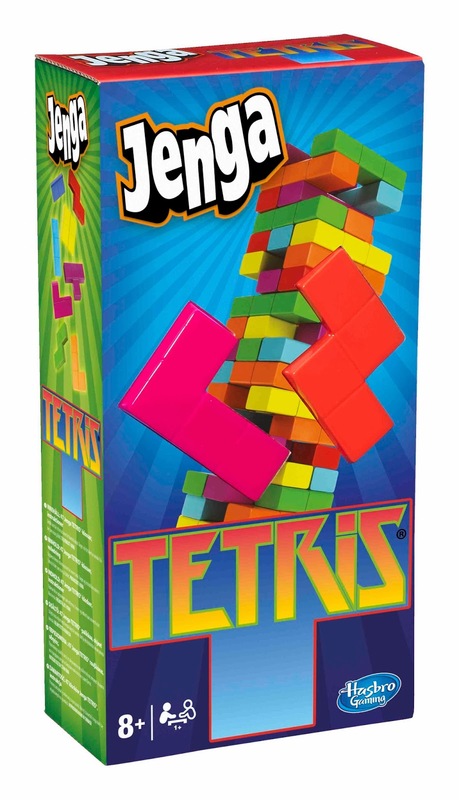 If you are looking for a great gift idea, adults and kids are going to love Jenga Tetris, at a retail value of under $15 this is a great bargain. A game that can be played with just one to many people this is a fun gift idea for that special game lover on your holiday gift list this year. This Jenga Tetris is a great combination of the two classic games, but without the mesmerizing Tetris music, ha ha. The generous folks at Hasbro are giving one of Susan’s Disney Family readers a chance to win Jenga Tetris! Would you like to win? Please visit the Hasbro site, take a look around then come back here and tell me what other game do you like from the site? There are also other ways to enter, please enter below. I love Talking Ben, I think he is so cute. I like their ELEFUN AND FRIENDS GATOR GOAL GAME! Thanks so much for the fantastic giveaway! I love Nerf guns from Hasbro. I like all those great and neat Nerf toy's on their site. I like the talking tom- so cute! monopoly is so classic and never gets old! I like the Shoutin' Sam! I like The Talking Tom! Moos like Jagger is pretty neat! I have to say though Monopoly is just one of those games I will always love to play! I like Elliot at the cuddle barn. I love the idea of icicle! Thanks so much for the chances to win this.